A friend of moms, who also loves bears, sent us a forwarded email. 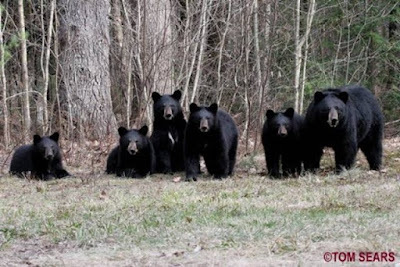 It's about a momma black bear in New Hampshire, and a photographer named Tom Sears. Black bears typically have two cubs; rarely, one or three. 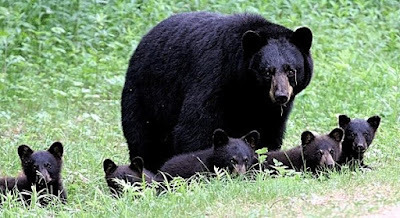 In 2007, in northern New Hampshire, a black bear Sow gave birth to five healthy young. There were two or three reports of sows with as many as 4 cubs, but five was, and is, very extraordinary.I learned of them shortly after they emerged from their den and set myself a goal of photographing all five cubs with their mom - no matter how much time and effort was involved. I knew the trail they followed on a fairly regular basis, usually shortly before dark. After spending nearly four hours a day, seven days a week, for more than six weeks, I had that once-in-a-lifetime opportunity and photographed them. I used the equivalent of a very fast film speed on my digital camera. The print is properly focused and well exposed, with all six bears posing as if they were in a studio for a family portrait. I stayed in touch with other people who saw the bears during the summer and into the fall hunting season. All six bears continued to thrive. As time for hibernation approached, I found still more folks who had seen them, and everything remained OK. I stayed away from the bears as I was concerned that they might become habituated to me, or to people in general, and treat them as `approachable friends' This could easily become dangerous for both man and animal. After Halloween, I received no further reports and could only hope the bears survived until they hibernated. This spring, just before the snow disappeared, all six bears came out of their den and wandered all over the same familiar territory they trekked in the spring of 2007. I saw them before mid-April and dreamed nightly of taking another family portrait, a highly improbable second once-in-a-lifetime photograph. On 25 April 2008, I achieved my dream. When something as magical as this happens between man and animal, Native Americans say, "We have walked together in the shadow of a rainbow". And so it is with humility and great pleasure that I share these exhilarating photos with you. Thank-you Tom, for sharing your beautiful photographs and the story behind them. When mom received this story and photos, she passed it along to me. After I decided to share it with you, I looked Tom Sears up online. If you are interested, he has more bear pictures, this story and other wildlife photos available in limited edition prints on his web site. I think this story and photos are awesome! That momma bear certainly had her paws full. Looks like her New Bear Orientation lasted at least a year and a half. Aren't they beautiful? I bet that den was crowded. I will update you soon on the New Bear Orientation. Mom has to sew this week, so she won't be able to help me post till she reaches her goal. I do hope the hunters leev them alone! Those are some very cute wee bears. I suppose they are not wee not, but they are still very cute. Mother bear certainly must have had her paws full. Glad you like the Submarine story you must show your Dad. Thanks everyone for stopping in. Glad you enjoyed the story about the momma black bear. I had to post it because they live in the state I was adopted from. Welcome to all of you who have recently joined my following. Be sure to check out Tat's blog, Bears on Location. They have an exciting submarine story, it's great.